Largehearted Boy: Book Notes - Githa Hariharan "Almost Home"
Book Notes - Githa Hariharan "Almost Home"
Githa Hariharan's essay collection Almost Home is a fascinating melange of memoir, travelogue, and history. "In essays that bespeak a thoroughly cosmopolitan sensibility, Githa Hariharan not only takes us on illuminating tours through cities rich in history, but gives a voice to urban people from all over the world—Kashmir, Palestine, Delhi—trying to live with basic human dignity under circumstances of dire repression or crushing poverty." 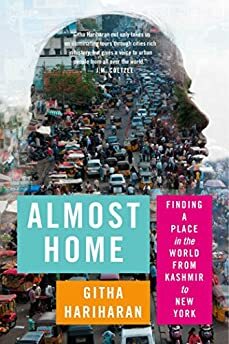 As I wrote Almost Home, Finding a Place in the World from Kashmir to New York, I found a team to take me through each city or country. Some of these guides were people I met, people who generously shared their stories with me. Then there were historical figures, from George Washington to Frantz Fanon, who needed to be brought to life so I could understand a little more about the places they come from. If I wanted to dig deeper, I needed the key members of my team: poets, painters and musicians. They provided the texture of places, the ideas and fantasies of real people. If I begin with revisiting the city of memories, I have to begin with music. I have to begin with the music of childhood, then let it flow outward, taking in more of the world. The first singing voice I heard belonged to my mother. My earliest memory is curling up on a floor mat at her feet, as she sang Carnatic music, classical music from South India. I was seven when my sister and I were sent across town in Bombay for a weekly music lesson. We were also taken to evening concerts with strict instructions not to fall asleep. I can only remember the struggle with sleep; but my parents tell me I listened carefully to a Carnatic singer I would later admire, and not just for her music. Everything about M.S. Subbulakshmi was the stuff of legend: her faultless voice, the rapture on her face when she sang, her beauty, her gentle nature, and her life story -- a complicated journey from the traditional “lower caste community of performers,” to the life of a naturalized Brahmin and star. There’s a song she sang at the UN, a song I heard as I wrote about her in my section on Manila, the city where I met her as a teenager. The song also took me effortlessly to the fifteenth century Vijayanagar kingdom that I wrote about when I compared Hampi and Washington D.C., two powerful cities at different points in time. The song was not by a man with conventional power; it was by Purandaradasa, a poet who sang his lines for the people, not the court. Subbulakshmi sang "Jagadhodharana...” and I could see Purandaradasa walking the medieval streets in South India, singing about Krishna’s mother Yasodha, who plays with him as if he were just her son, a child, and not a god. But Bombay’s cultural life was not personified by Carnatic music. The very air of the city was and is permeated by the music of “Bollywood”. The cinema factory of Bombay took us to many places, most of them fantastic and sumptuous; as different as possible from our real lives. It took us, for instance, to Kashmir, a cool paradise where houseboats floated on lakes and love stories unfolded with ease and glamour. The celluloid Kashmir extended the theme of love to a more didactic take on what makes a “good, traditional Indian life”. In the 1965 film Jab Jab Phool Khile, Shashi Kapoor played a wise rustic who teaches the city-sophisticated woman he falls in love with what it is to be “Indian”. He sang, soulfully, the song “Yahan Main Ajnabee Hoon” the equivalent of “I feel strange here”. (The “here” refers to a “western-style” dance party.) The memorable line of the song, though, is “How can I forget I am Indian?” My eleven-year-old heart was probably touched then. All these years later, I see how the song turned a contested part of India to a refuge where non-Kashmiri Indians could go for R and R, falling in love, or honeymoons. Even Bollywood began to see Kashmir differently in subsequent decades, but the earlier music remains in our heads, like a silly childish memory. Less childish are the more recent memories of film music set in Kashmir. These play a melodramatic tune to patriotism, constructing an emotive dimension to the loud “India versus those who would break India” kind of nationalism. In the film Roja, the Indian national flag is set alight by caricature terrorists. The hero, being heroic, rolls on the burning flag to save it. As in all nations, the flag can be made to reduce all complexities to a powerful unifying symbol. The music, a song called “Bharat Hum Ko” is as high-pitched and hysterical as both love and fear for the nation. When I visited Kashmir in 2011, I saw a militarized state with people longing for normal lives. And, ironically, this is when I discovered the beauty of Kashmir’s folk music—the rabaab, for instance, played in Central Asia as well. Cultural practices do not care about national borders. Perhaps this dissolving of borders, the leaking of one layer of cultural memory to another, is what made me at home in Cordoba – at least the Cordoba of the past. The poetry of the music, and “fusion” as an intrinsic part of all singing and dancing, uncovered the richness of Cordoba’s diversity -- not unlike the diverse India I know. A perfect example is “From Damascus to Cordoba” -- “Spanish-Arabic fusion” played by the oud (Abdelsalam Khair) and the guitar (Juan Martin). But life and travel do not reveal only convergence, and nor does my book. There’s always conflict; oppression; and resistance. In many of the cities I went to, from Algiers to Ramallah to Delhi, it was the music of people’s resistance that spoke to me most sharply. In Algiers, I heard, though it was the 50th anniversary of freedom from the French when I went there, the unifying memory of the fight for freedom. I heard an old recording (of indifferent quality) of a song sung by the freedom fighters in Algeria between 1954 and 1962. The story is that the song was composed by the poet Moufdi Zakaria, who used his own blood to write it on the wall of the colonial prison where he was incarcerated. Later, Mohamed Tourki, a Tunisian, and Mohamed Fawzi, an Egyptian, set the poem to music. The song, apparently recorded by Italians shortly after the war, became an anthem in 1963. I didn’t understand the words; but it gave me the same sense of the Algerian passion for freedom I got when I watched the iconic film The Battle for Algiers. As I wrote my book, I heard more calls for freedom, and from our own times. In Occupied Palestine, I heard (and saw) a rap number called "Gaza – Palestinian Gangnam Style." This funny and sad video is uncompromising about daily life in an occupied Gaza. There’s no fuel to run a car, the shops are empty; nothing, in fact, works. But still the energy of the humor and the dancing tells you exactly what the spirit of resistance is all about. There’s a footnote here: apparently, even the Israeli army found this music so catchy that they danced to it and got into trouble with the authorities. Finally, home. Delhi, today’s Delhi. There’s beautiful classical music in the city, there are officially sponsored spectacles of lively folk music. But above all, there’s the music of those who want a better India. A country that can only be home if it belongs to all its people, each and every one of them, regardless of class, gender or caste. In early 2016, a scholar in Hyderabad University committed suicide. Rohith Vemula was a dalit -- literally “son of the soil”, the term used by lower castes to describe themselves. Rohith’s death sparked both anger and sadness. A bright student, he was a political activist, but the system of caste discrimination defeated him. In death, though, he is not a symbol of defeat, but resistance. Sheetal Sathe, a singer who knows what it is to be hounded for questioning caste-based discrimination, sang a deeply moving song in Delhi, "Rohith Gaya, Dalit Gaya, Mar Gayi Hai Lokshahi". "Rohith's gone, a dalit is dead, and with him dies democracy." She sang about how caste erodes the education system; but she ended on a positive note. In Rohith’s name, she sang, the struggle will continue, and more dalit students will go to universities to keep Indian democracy alive. "Evocacion de Damasco a Cordoba (From Damascus to Cordoba)," Spanish Arabic fusion music, oud and guitar, guitar played by Juan Martin, and oud played by Abdelsalam Khair.